The North Korean leader’s first trip overseas in 2019 is to China. On Tuesday morning, Chinese state media and North Korean state media confirmed that North Korean leader Kim Jong Un had traveled to China for a fourth summit meeting with Chinese President Xi Jinping. Kim had gone to China at Xi’s invitation, according to the reports, and would stay in China from January 7 to 10. Notably, Kim would be spending what is presumably his 35th birthday on January 8 in China. Confirmation of Kim’s trip came after South Korean media reported that the train known to be used by North Korean leaders to go to China had transited the Sino-North Korean border at Dandong. Kim used the same train to visit China last year. The trip marks Kim’s first overseas visit in 2019 after a year that saw him look to the outside world. In 2018, Kim met with Xi three times—the same number of times as South Korean President Moon Jae-in. During his first meeting with Xi last year in March, which was also his first overseas trip since assuming the mantle of leadership in North Korea in December 2011 after his father Kim Jong Il’s death, the Chinese president emphasized the importance of “high-level exchanges” between the two countries. “Under the new circumstances, I am willing to keep frequent contacts with Comrade Chairman through various forms such as exchange of visits, and sending special envoys and letters to each other,” he added. Kim would return to China twice: once before his summit meeting with U.S. President Donald J. Trump in Singapore in May and once after, in June. During the final trip, Xi accepted an invitation from Kim to visit Pyongyang. That visit has yet to take place. Though China has historically been North Korea’s most important partner and closest benefactor, relations between Pyongyang and Beijing had appeared to cool as North Korea pursued the completion of its nuclear deterrent—a milestone that Kim celebrated in November 2017. 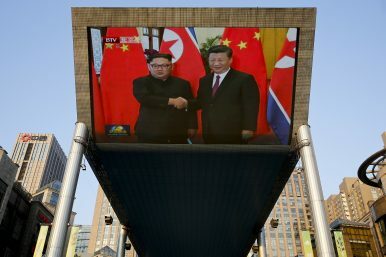 The Sino-North Korean rapprochement that began last year saw both sides emphasizing the enduring historic nature of the relationship between the two countries. The North Korean leader congratulates Xi as he enters his second term as China's president.